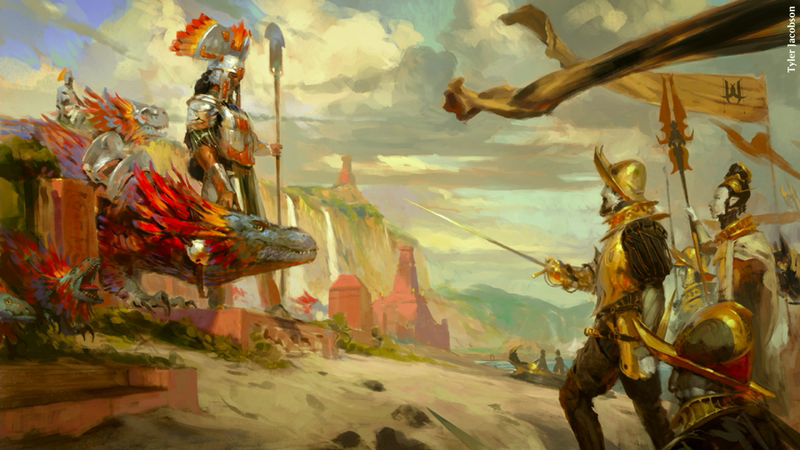 The larger world is unknown and only implied, as the action all takes place in or around the islands that make up Ixalan, a tropical location in the Inner Sea. I’d classify it along the lines of the Jakandor micro-setting in 2e AD&D, a self-contained region that doesn’t require a complete world to support it. Now for the kicker. This setting is everything that Maztica should have been, and puts the entire ToA effort to shame as far as world building. A good start to the setting’s premise. So much went well in this slim 47 page pdf that it’s hard to parse it all. Balanced Powers. The setting is (very loosely) patterned on the conquest of the Americas and concurrent buccaneering era of the Age of Piracy. However, in this case, unlike the usual pattern of a fantasy group encountering a woefully ill prepared historical recreation, everyone is fantastical. The Empire of the Sun has magic, dinosaurs, and numbers; the Brazen Coalition has diversity of player races, technology, and nothing to lose; the River Heralds have magic and elementals; and the Dusk Legion have a type of Vampire and a whole load of military success. Maybe it’s the MtG influence, but there’s a rough parity, as opposed to the normal historical repeats that have become the norm. Diversity. 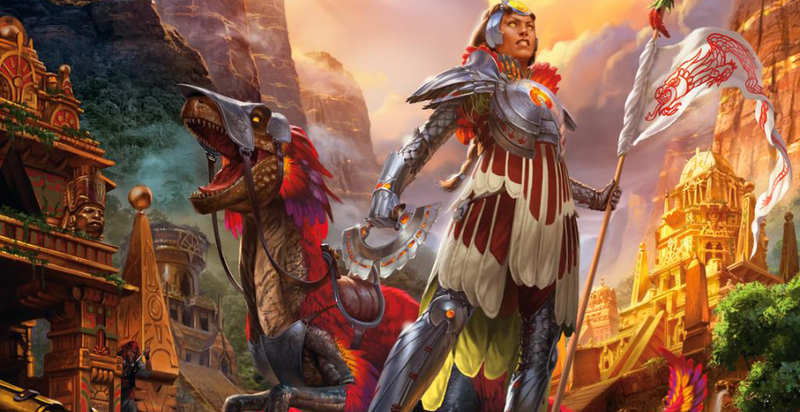 This sets a new bar for WotC as far as I’m concerned when it comes to serious diversity and taking a reduced colonial position on non-European derived cultures and civilizations. Unlike the peoples of Chult or Maztica, the native culture (a generic Meso-American/South American Mayan/Incan fantasy feeling operation) is functional. 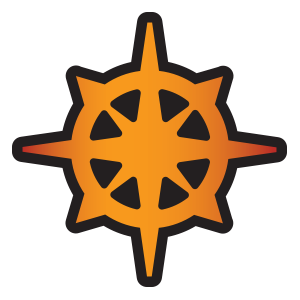 The Sun Empire isn’t what it was, but it’s still a vibrant, functional civilization that is able to defend itself, and is actively taking an interest in controlling their destiny, reclaiming lost lands, and all that good stuff. They’re also depicted in a positive light, with no hints of the usual “Pre-contact Americas ideas? Fire up the human sacrifice train and read me some more Spanish propaganda!” nonsense that fictional cultures inspired by these real cultures usually get hit by. Dynamic and active, and adapted to their environment. The Brazen Coalition are the survivors and refugees fleeing the conquest of what I’ll call “the conquered lands”. Their numbers are comprised of humans and orcs from the conquered lands along with non-humans who joined them en route and from Ixalan. They are, based on the art, Black African and European humans with a strong pirate vibe (as mentioned, they are buccaneer-tastic). They’re pirates by necessity, driven from their homes by the Dusk Legion, and refused rights to settle by the Sun Empire (probably for good reason). The art depicts a great mix of peoples in this faction, which is why I’ve included them here. Embrace of Fantasy. It’s amazing what you can do when you’re not labouring under 40+ years of lore that is assumed to be “just how it is”. This setting breaks hard from the traditional player race selection of D&D, and takes new positions on what things look like and how they act/interact with each other. So instead of retreading a well-worn road, this takes a side path, looks back at the familiar road, and then laughs and heads away from it. Merfolk, goblins, orcs, sirens, humans, and vampires make up the choices here, and it’s well executed. Additionally, all their stats are included, and directions are given to other resources. Dinosaur cavalry? Sign me up! Art. The art is positively gorgeous and I cannot stress that enough. At 47 pages, this booklet doesn’t have a lot of space to convey setting, feel, genre, or anything else. This is where good art choices can make or break something. In this case, the art made it work. It conveyed the epic scope, danger, and feel of the setting. It was also completely unambiguous in portraying POC as POC. There’s no “Hmmm, maybe that character is a POC?” here at all. Also, the dinosaurs are positively epic. Dinosaurs that don’t manage to look this good in future will be a profound let down. Use of other material. This 47 page booklet shines at this. Its bestiary is a combination of new entries, and excellent descriptions of monsters followed by examples from the Monster Manual for getting stat lines. Looking to link back to other Plane Shift material? That’s there too. It even points players towards the free D&D Basic set online for those who don’t own the books (I guess MtG fans looking for more?). It’s well done and works to allow the booklet to convey more information than what the page count would allow. You can’t tell me that a parrot/leopard hybrid variant of a gryphon isn’t awesome. Adventure Hooks. Admittedly, the whole thing is an adventure hook, but in this case, I’m talking about drive and motivation. The gross motivations of the four factions are there, but there’s a lack of NPC’s and other bits and bobs that ease the way. It’s a nitpick, but it was a weak area. Mapping. The only reason this is here instead of in the “What Went Well” category is that the map is beautifully rendered, but badly labeled. In order to find out who held what, I had to hit MtG websites. As a GIS Technician and aspiring cartographer, this really irritated me, since maps need to convey information clearly and accurately in cases like this. 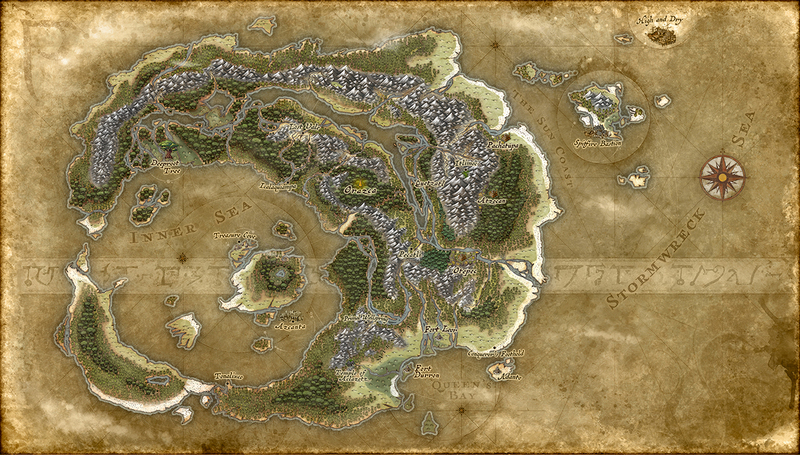 But that said, it’s at least a COMPLETE MAP for the region, and it’s amazing. I love me a complete campaign setting map, and this is well drawn to boot! Religion. This was a mixed bag. The Sun Empire was brilliantly handled, introducing an aspect system to the game; where a single god has different aspects which grant access to different divine domains. It was awesome, and it also gave me clear guidance for introducing it into my homebrew games. Whereas the Church of Torrezon (proper name for the Church of Dusk?) was scattered all over and had less definition and explanation. Clearly religion plays a big part in this micro-setting, so details would have been good. Integration of MtG Mana. The five colour mana system from MtG was expanded on in reference to using it as a mechanic in D&D in Plane Shift: Ixalan. It was a bit of a cruel tease, since it comes just short of becoming a truly usable mechanic. Had they associated spells with, and created domains for, the colours on mana (effectively supplanting domains and the schools of magic in D&D) it would have been a breakthrough shift in how magic is perceived and used in game instead of simply being a personality and alignment guide. Cultural Descriptions. These were pretty lacking. There were lots of implied things, and I think if they could have squeezed one or two more pages, they could have nailed this too. Knowing the culture of a group goes a long way to boost immersion, and in the cases of the Sun Empire and River Heralds, the two factions we have little cultural anchoring to, I think this would have been a good expenditure of time and space. A bit more history would be good too, like about the Queen of the Dusk Legion. Equipment. This is a strongly cultural driven setting, with four specific factions, two of which are going to be different from the usual stuff. The Brazen Coalition and Dusk Legion are supported fairly well by the standard D&D books, but the Sun Empire and River Heralds aren’t. 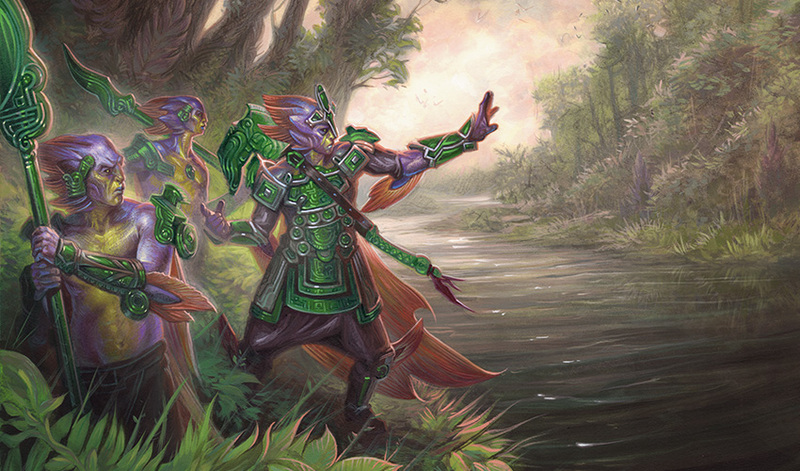 Looking up more art, the River Heralds seem to have some jade based technology, and the Sun Empire appears to have metal or some sort of crystal. This is the kind of detail that slips a lot, and really needed to be covered. I need stats for this sort of awesome. Magic Items. There was no equipment section, and the treasure section had a lot of great literal treasure (art, objects etc…), but no magic treasure. Magic items, especially ones for a small setting like this, can add a lot of flavour and feel to the setting by showing what the peoples prioritize when it comes to using magic. The setting’s ultimate McGuffin, the Immortal Sun artefact, is absent too. Damn it Wizards! Why can’t you do this for regular D&D products?!? Seriously. Reading this 47 page booklet and seeing a full map to the area had me wanting to play in this setting RIGHT NOW. I’m sure the setting isn’t perfect, after all, I’m a Black Canadian blerd, and I’m looking at things through specific lens and only at this particular product, not the wider MtG background for it. It’s entirely possible a things I found positive would elicit eyerolls in people from the applicable ethnic background and associated concerns. But I will say, that to me, this pdf at 47 pages did a lot more to dial up diversity for D&D products than all 255 odd pages of Tomb of Annihilation. Everything is presented as active, participating, and nothing is there as window dressing to sit in the background while others do everything. I’m going to look into the other Plane Shift stuff now, and see what other free gems are out there. Is this free download worth it? Absolutely. It’s barebones, but it’s functional and with a bit of polish, has a lot of potential. The fact that I looked up extra art to include speaks volumes about how much this work impressed me. 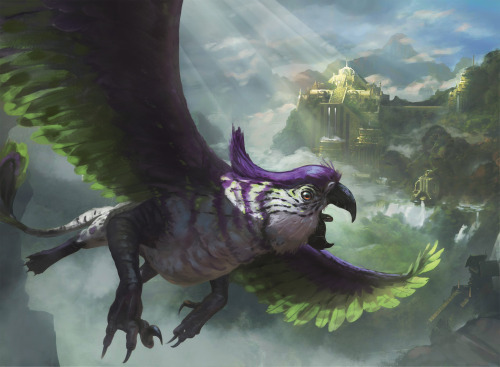 Plane Shift: Ixalan is available free to download here. So, I have to ask again, how is it that WotC can create something like this, a free to download product that is literally everything Maztica should have been, and that shows what sort of result ToA could have had, not be able to do this for mainstream D&D? All art used in this post is property of Wizards of the Coast, and has been used here for review purposes.